What a great day - starting with the workshop where I did a one to one with Coco the staffie who had a few 'social behaviour' problems - with other dogs. Have arranged to meet Coco and her owner next session to work on her behaviour. 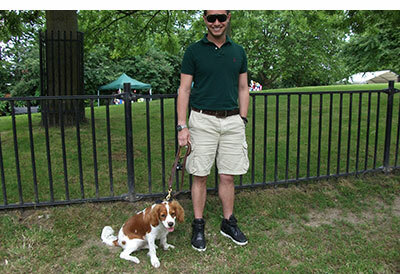 As the Queens Park Community Festival I decided to have a 'doggy factor' event where the most appealing mutt was chosen by our local councillor - The winner was Olly a retriever and second was Emma a jack russell - both well known in Queens Park!! 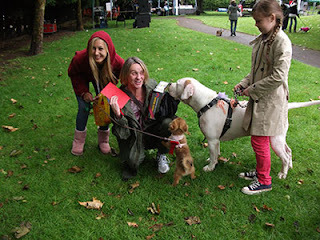 Every year a community trophy is given to the dog and their owner who has improved in both behaviour and benefited mostly from dog socialising classes. 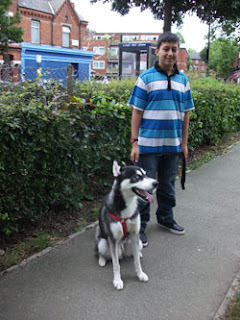 This year was Shadow a two year old husky owned by the Fahr Family. 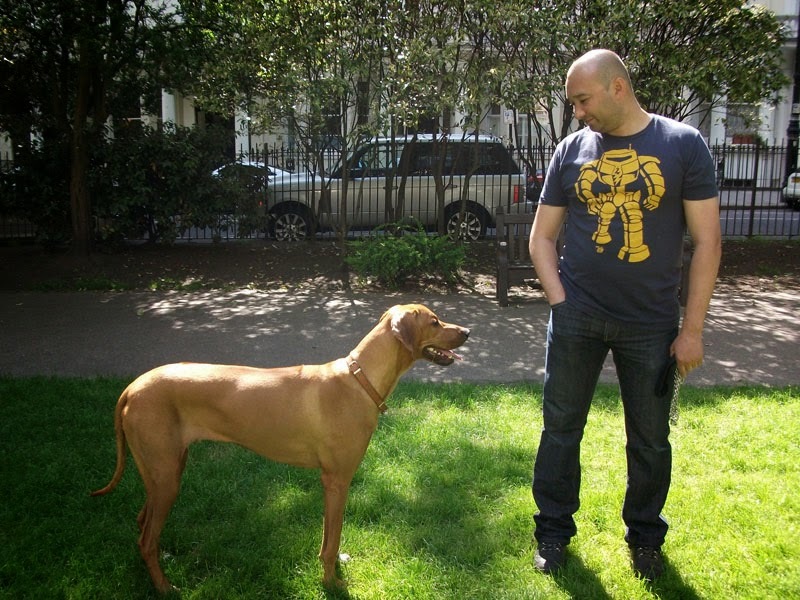 David Fahr walks Shadow two or three times a day, walks him on a lead, but why I chose David is because he makes other dog owners aware of being responsible and of the correct way of looking after your dog. Well done David. 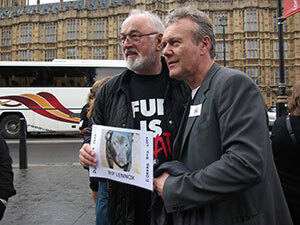 14th July 2012 at Old Palace Yard Westminster London Peter Egan and Anthony Head supporting the Peaceful Protest against BSL. BSL is a law that was made to victimize a certain breed NOT the deed and should be ended and Governments and Political Leaders should start education and neutering programmes and make any form of animal abuse be penalised with a lengthy prison sentence. 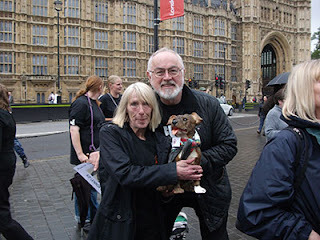 Supporters came from all over UK to be the Voice for the Innocent Bull Breeds that have been seized, kenneled and some DESTROYED under this Law. Also we came to pay tribute to Lennox's memory a staffie/labrador who from May 2010 until July 2012 was kept in unspecified kennels and despite worldwide petitions was killed by BCC Belfast Ireland. May this beautiful dog whose owners did everything in their power to be law abiding and responsible dog owners - May Lennox now rest in peace - but the protest for Justice goes on. The first Dog Show in Tamplin Mews W9 funded by the Harrow Road Ward of Westminster UK was a great success despite the weather. Up at the crack of dawn to make sure barriers were in place - marque was erected and everything was in place. Indulgent dog owners with breeds big and small waited with anticipation of winning the 'Ms Diva', 'Mr Slick' or 'I luv My staffie' and other categories. Enthusiastic barks and excited pooches filled the Tamplin Mews 'open space'! Bella the Sharpei cross a young pup came to the workshop for work on her recall - and walking to heel on the lead. Two people came to the workshop to ask advice on neutering the dogs - and whether it altered their dogs 'behaviour'. One lady was quite upset about how a man was treating his dog and wanted to know the contact details for reporting it. The workshop is for dog owners not only to have some training more on a one to one basis but also to ask advice on neutering, microchipping, toilet training and any other issues or questions they may want to know. Also free poop bags are given out to other dog owners.